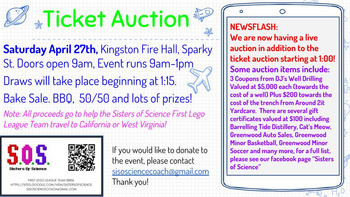 Sisters of Science (SOS) is a female only FIRST Lego League (FLL) team based in the Annapolis Valley, Nova Scotia, Canada. The team was founded in 2014 with a mission to inspire local young women toward careers in science, technology, engineering, and mathematics. Building on successes in previous seasons, on Feb 16, 2019, the team placed 3rd overall at the maritime regional championship at Acadia University. They also won the Innovative Solution Award for their project entry and received the regional nomination for the FLL Global Innovation Award. The team also qualified to attend the Mountain State Invitational competition in West Virginia this coming July. As well as a nomination to apply for the Global Innovation award in San Jose, California this coming June. (The team will only be travelling to one competition depending on the outcome of their application for the Global Innovation Award). The team is currently fundraising to cover registration and travel costs to attend the competition in California or West Virginia. The team is run by volunteers and all funds raised go directly and only to team expenses. Some of the items available include: 3 coupons from DJ's Well Drilling valued at $5,000 each towards the cost of a well. 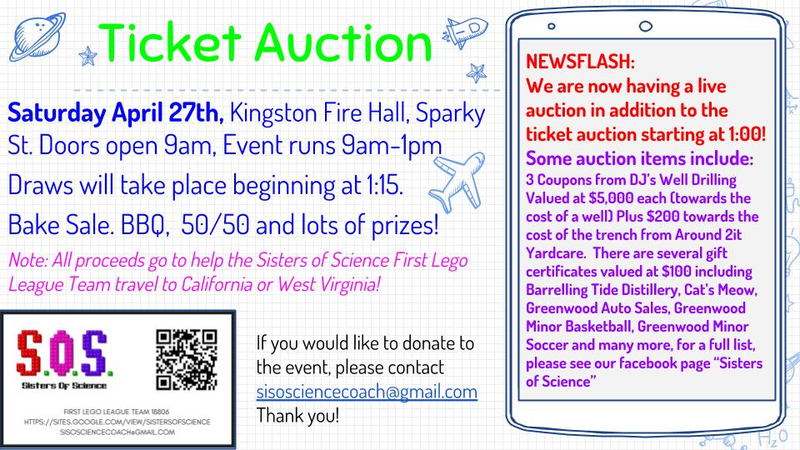 We have items from Barreling Tide Distilleries, Cat's Meow, Greenwood Auto Sales, Coleen McRae Esthetics, Fresh from the Oven, Best Western Glengarry, Greenwood Minor Basketball, Kingston/Greenwood Soccer association and many more! !